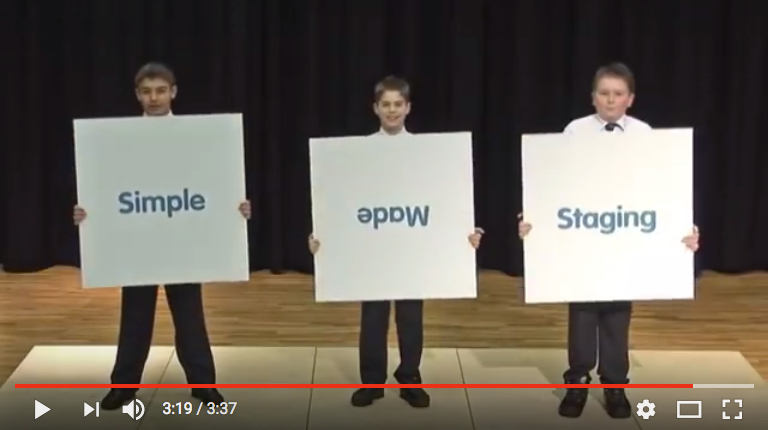 Watch our fun little video below, showing 3 lads building a Portable UniStage for their School. UniStage portable staging is modular, lightweight, strong, quiet, versatile and as you can see, very simple to build. Step 1: Layout the first row of frames – as you can this is a very simple process, just decide where you want your frames and place them accordingly. Step 2: Insert the UniLinks – our unique system is designed to keep your staging stable and safe. There are 2 types of Unilinks, ‘2-Way’ for the outside and ‘4-Way’ for inside. Step 3: Locate the UniDecks – these easily slot into place with our unique fitting system. Step 4: Build your next set of rows – each frame slots in to the corresponding UniLink from the previous row. As you can see in the video, frames and decks are stored neatly on the trolley for ease of storage and relocation. Step 5: Attach the stage steps – simply add the steps to the frame before attaching the last row of UniLinks and UniDecks. To request a quotation or a free on-site demonstration click here, call 01254 959040 or view our Portable Staging for Schools pages for more details.